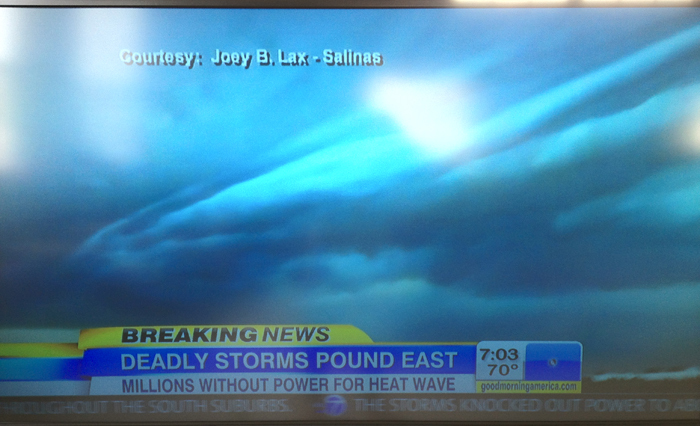 My storm video from June 29, 2012 near Tinley Park was featured on Good Morning America on the morning of June 30, 2012. A big thanks and shout out to Ginger Zee who used my video in her broadcast! View more of my weather photography and videos! A shelf cloud in a severe thunderstorm develops around 11:45am in Matteson, IL south of Chicago. 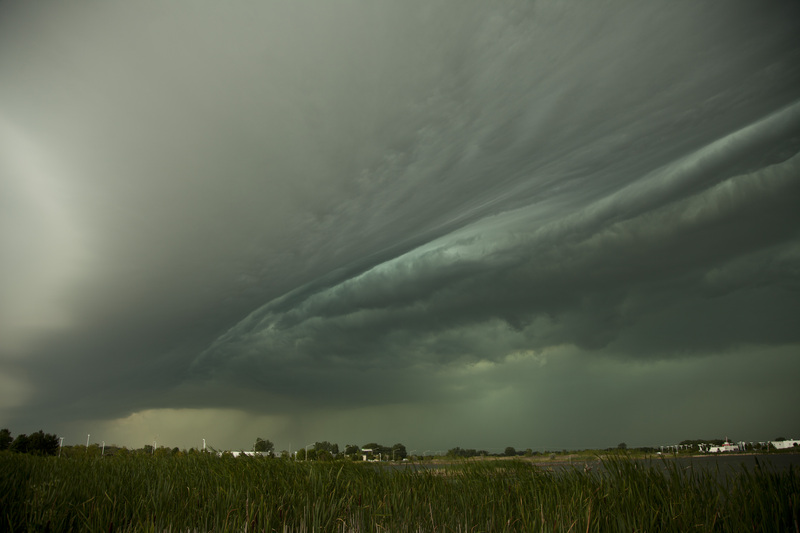 This type of storm is known as a derecho and in this particular storm, the cells grew in Illinois and caused a devastating path of destruction across the eastern United States all the way to Washington DC and north through New Jersey. This photo was taken not long after the storm formed in western Illinois. This photo was taken near I-57 and US 30 (Lincoln Highway). Click the photo to enlarge and see full resolution version. View more of my weather photography! NEWS AGENCIES: I give you permission to use this photo. Please credit JoeyBLSPhotography.com when using in print or broadcast. UPDATE: This video was featured on Good Morning America on June 30, 2012. 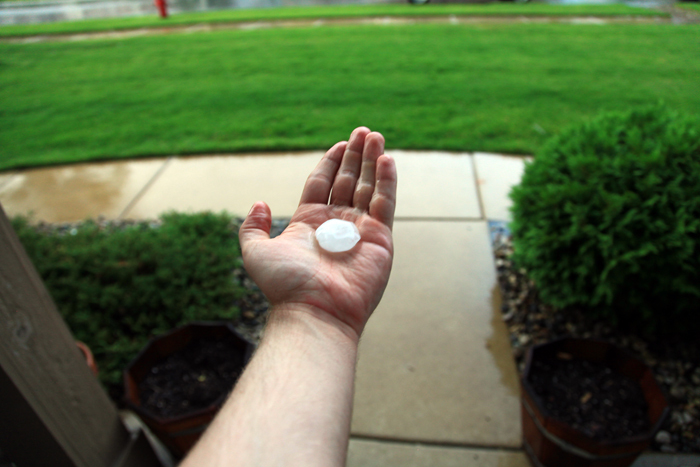 Northwest Indiana hail storm on the evening of June 28, 2012. This photo was taken in Schererville, Indiana. 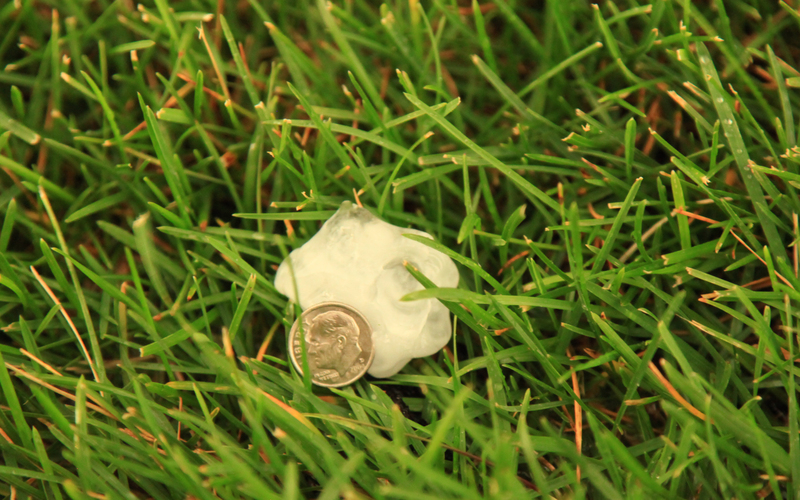 The hail stone is held up against a dime for comparison. 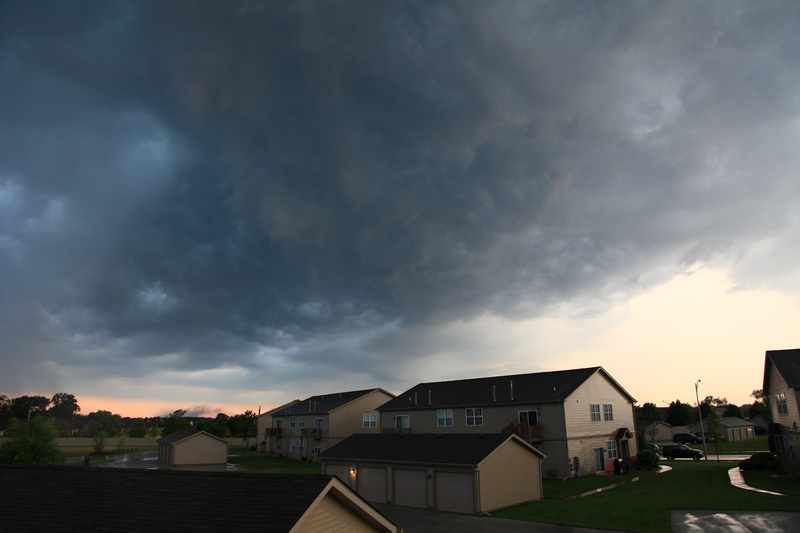 This storm passed through Schererville at around 7:30pm. Click on the photo to see the full resolution version (approx: 5600×3700). NEWS AGENCIES AND REPORTERS: You have my permission to use these photos in any news broadcast with credit given to the images. Please credit JoeyBLSPhotography.com. Thank you! 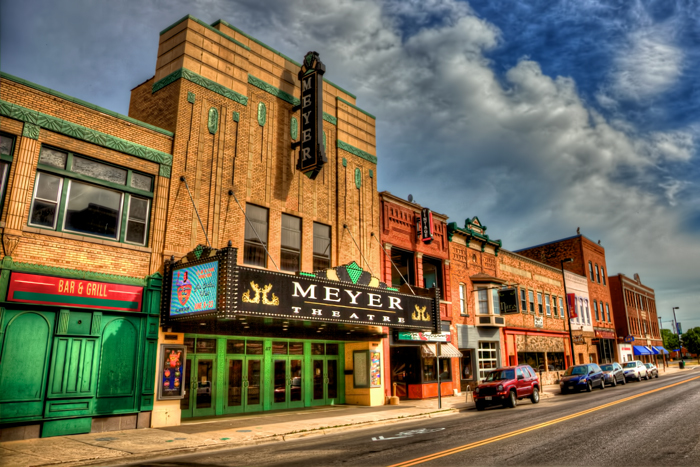 The Meyer Theatre in downtown Green Bay is located at 117 South Washington Street and has been an entertainment venue in the Green Bay area since 1930. The theater originally opened as one of many Fox Theaters and then became the Bay Theater from 1933-1998. This historic venue has hosted many famous musicians, actors, graduations and other events over the years and continues to be a popular theater today. If you enjoy photos of old theaters, check out my photo of the Palace Theater in Lake Placid, NY taken in May 2011. Meyer Theatre in Green Bay, Wisconsin by Joey B. Lax-Salinas is licensed under a Creative Commons Attribution-NonCommercial-NoDerivs 3.0 Unported License. Permissions beyond the scope of this license may be available at http://www.joeyblsphotography.com. The beach in AuTrain, Michigan along Lake Superior. Growing up near the Indiana Dunes along Lake Michigan, it felt so different to be up on the shores of Lake Superior. A few surprises to me were the lack of small rocks along the beach and the shoreline. In Lake Michigan along the shoreline, there are colorful bits of river rock that have eroded into smooth pieces and piled up right at the shoreline. 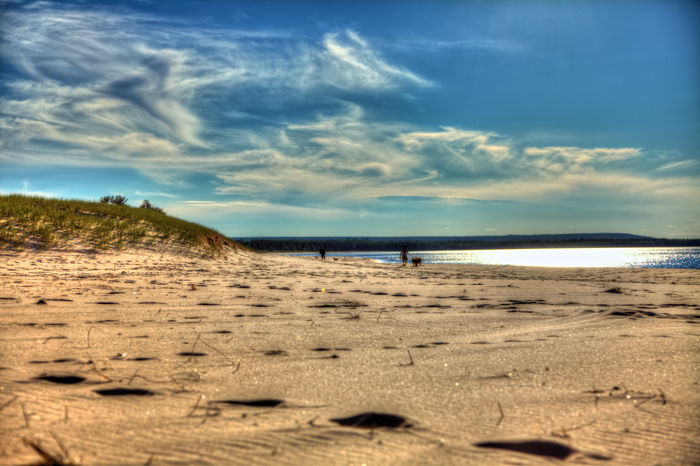 At AuTrain Beach, there was not a single rock along the shore and even into the water, no rocks could be seen. This photo was taken while taking a road trip around Lake Michigan in June 2012. Be sure to check out my photos of Mackinac Island, Traverse City and Door County which were taken on the trip as well! In the background of this photo, you can see a man walking with his dogs. I will post a better photo below. As I drove away, I handed this gentleman a business card and I hope he sees the photo below! AuTrain Beach in Michigan by Joey B. Lax-Salinas is licensed under a Creative Commons Attribution-NonCommercial-NoDerivs 3.0 Unported License. Permissions beyond the scope of this license may be available at http://www.joeyblsphotography.com. As the ferry pulls into Mackinac Island, a marina and harbor can be viewed on the starboard (right) side of the boat. In this photo, the harbor sits nearly empty while many of the boats head out to open waters on this beautiful June 2012 afternoon. Shortly after arriving on Mackinac Island, I visited the historic Grand Hotel, which was built in 1887 and is a historic landmark on the island. Mackinac Island Harbor and Marina by Joey B. Lax-Salinas is licensed under a Creative Commons Attribution-NonCommercial-NoDerivs 3.0 Unported License. Permissions beyond the scope of this license may be available at http://www.joeyblsphotography.com. 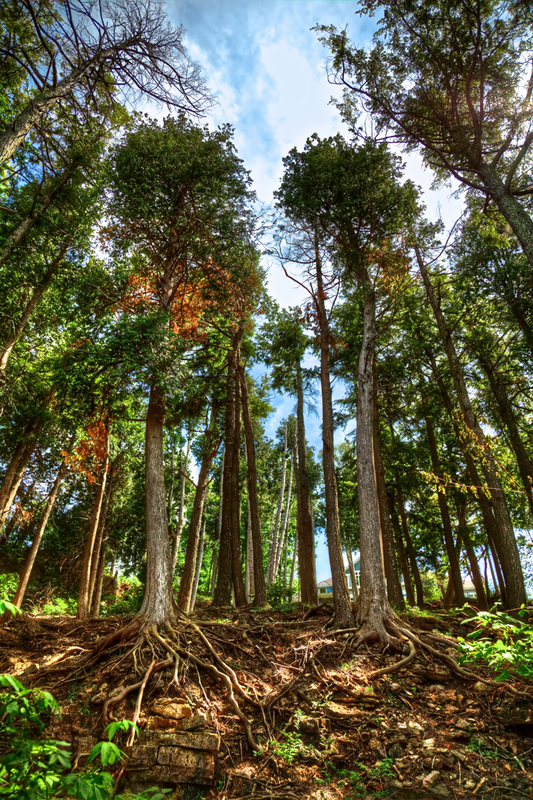 These trees are hanging on tightly with its roots to the rocks beneath along a private nature trail along Sister Bay in northern Door County. This photo was taken along the Country House Nature Trail in June 2012. Trees and Roots in Door County by Joey B. Lax-Salinas is licensed under a Creative Commons Attribution-NonCommercial-NoDerivs 3.0 Unported License. Permissions beyond the scope of this license may be available at http://www.joeyblsphotography.com. In June 2012, my girlfriend Rose and I took a week long vacation traveling around Lake Michigan. On one of the days of our trip, we spent the day at Mackinac Island. We both love the movie Somewhere in Time, which was filmed on the island in 1979 and I’ve been playing the This is a montage of video clips from our time spent on Mackinac Island in June 2012 set to the music of Theme from Somewhere in Time, which I had the privilege of being able to play in the Grand Hotel itself. After we returned from vacation, I put this video together using a montage of video clips from our time spent on the island and produced this video as a surprise for Rose. NOTE: I do not own or claim the copyright to this music. The Alexander Hamilton U.S. Custom House is located in lower Manhattan and was built between 1901-1907. This building was placed on the National Register of Historical Places in 1972 and was designated a National Historical Landmark in 1976. The Bowling Green Subway Station is located in from of the U.S. Custom House. U.S. Custom House in New York City by Joey B. Lax-Salinas is licensed under a Creative Commons Attribution-NonCommercial-NoDerivs 3.0 Unported License. Permissions beyond the scope of this license may be available at http://www.joeyblsphotography.com. 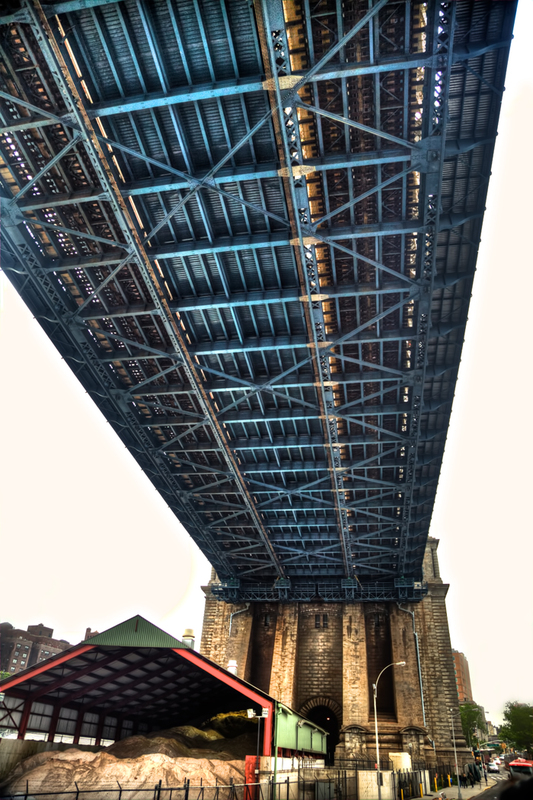 The view from underneath the Manhattan Bridge in New York City. The Manhattan Bridge is located near the Brooklyn Bridge on the east side of Manhattan Island and spans over the East River. Construction on the Manhattan Bridge began in 1901 and completed in 1912, making the bridge over one hundred years old. The bridge spans over one mile and is traveled by over 70,000 vehicles a day. The Manhattan Bridge, New York City by Joey B. Lax-Salinas is licensed under a Creative Commons Attribution-NonCommercial-NoDerivs 3.0 Unported License. Permissions beyond the scope of this license may be available at http://www.joeyblsphotography.com. A photo of Central Park in New York City. This photo was taken while I was on my east coast road trip in May 2011. Central Park Pond in New York City by Joey B. Lax-Salinas is licensed under a Creative Commons Attribution-NonCommercial-NoDerivs 3.0 Unported License. Permissions beyond the scope of this license may be available at http://www.joeyblsphotography.com. 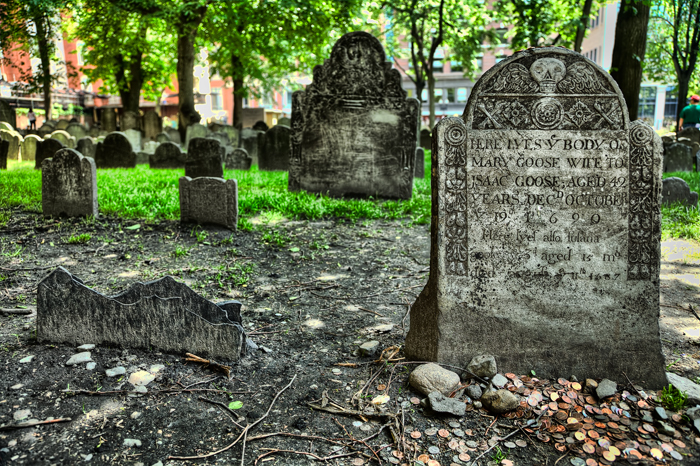 The grave of Mother Goose lies in the Granary Burial Ground Cemetery in the middle of downtown Boston. There are claims that this grave is not the actual Mother Goose and that Mother Goose stories appeared well before the life of Mary Goose, but in Boston, it is widely accepted that this is the actual Mother Goose. According to her headstone, Mother Goose (whose real first name is Mary) died in 1690, about thirty years after the cemetery first opened. Other notable historical figures in this cemetery include John Hancock, Paul Revere, Samuel Adams, Crispus Attucks and many others who were prominent figures in the history of Boston. Mother Goose’s Grave and Headstone in Boston by Joey B. Lax-Salinas is licensed under a Creative Commons Attribution-NonCommercial-NoDerivs 3.0 Unported License. Permissions beyond the scope of this license may be available at http://www.joeyblsphotography.com. A beautiful day to walk around downtown Boston! This photo was taken on a spring day in May 2011 while I was visiting Boston for the day. The Old North Church steeple can be seen in the background. Downtown Boston near Boston Common by Joey B. Lax-Salinas is licensed under a Creative Commons Attribution-NonCommercial-NoDerivs 3.0 Unported License. Permissions beyond the scope of this license may be available at http://www.joeyblsphotography.com. 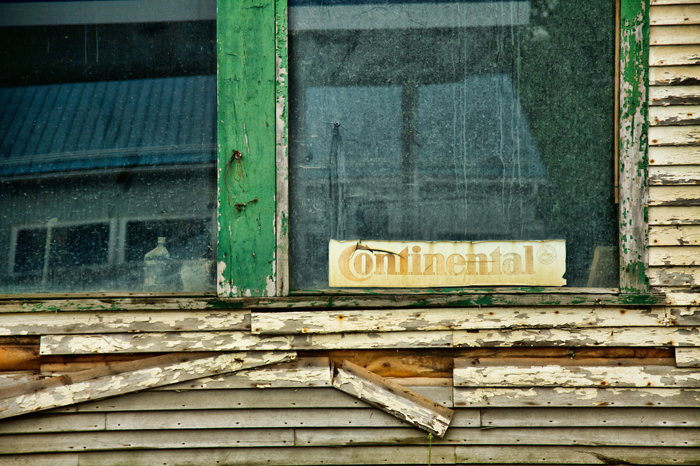 Driving through Hardwick, Vermont, I came across a couple of shuttered businesses, one of which had an old Continental Tires sign in the window. Long gone are the days when tires were changed at this old garage, but the building still stands. I am not sure how long this business has been closed, but by the looks of the building, windows and everything else in the immediate area, it doesn’t look like anyone has put a new Continental tire on a car for well over a decade. None the less, I love shooting photos of old stuff, buildings, cars, abandon places and reminders of days that once were. Old Continental Sign in Vermont Window by Joey B. Lax-Salinas is licensed under a Creative Commons Attribution-NonCommercial-NoDerivs 3.0 Unported License. Permissions beyond the scope of this license may be available at http://www.joeyblsphotography.com. 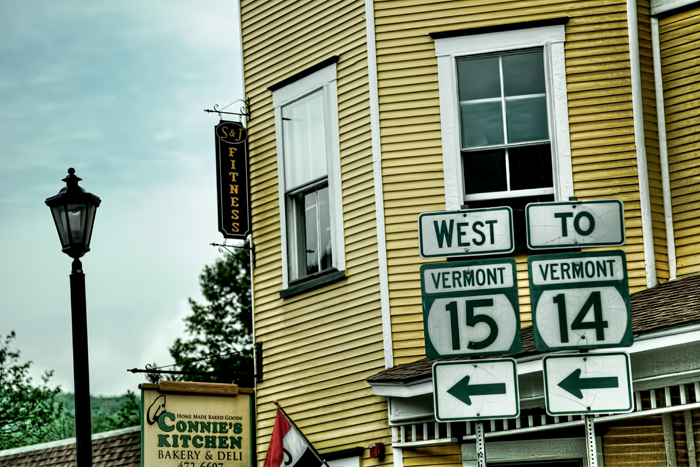 This photo was taken in Hardwick, Vermont in May 2011 near Connie’s Kitchen Bakery & Deli and S & J Fitness, both of which are located along the main road going through Hardwick, VT.
Hardwick, Vermont wasn’t a town that I was planning on driving through, but I did end up going through there as I was taking a detour off of US 2 during the spring 2011 rains that hampered much of the northeast throughout the months of April and May. US 2 had been closed in several sections due to overflowing rivers as well as many areas where the ground was leaking out from under the road causing it to buckle and collapse. In fact, in one area along our detour, I drove around a bend and right through about three inches of rushing water that was beginning to crumble half of the two lane road I was driving on. Crews were there and surely it was only a matter of minutes before that roadway was closed to traffic. The detour ended up taking more time than we had though (mainly due to a Memorial Day parade that backed up traffic in town and closed some of the local roads) but shortly after passing through Hardwick, I took an amazing photo of the side of a barn near Sabin Pond in Woodbury, all be it while driving 45 miles an hour. It was one of those moments where I had my camera, saw the barn and just lifted the camera and took the photo and kept driving. I also took a photo of Tucker Cars in Hardwick and one of an old Continental Tires sign in a window. which after a little bit of Photoshop effects, looks like a rustic and interesting old place that is loaded with history. Those lucky moments don’t come often; most of the time it ends up being too blurry to use. Hardwick, Vermont near Connie’s Kitchen and S & J Fitness by Joey B. Lax-Salinas is licensed under a Creative Commons Attribution-NonCommercial-NoDerivs 3.0 Unported License. Permissions beyond the scope of this license may be available at http://www.joeyblsphotography.com. The Holiday Inn – West Bay in Traverse City is located just east of downtown Traverse City along the shores of the Grand Traverse Bay. I stayed at the Holiday Inn West Bay during my stay in Traverse City from June 9-11, 2012 and had an enjoyable experience. Our room was located in one of the best locations in the hotel; in the northeast corner on the top floor. The room overlooked the Grand Traverse Bay to the north and the east, which made for a relaxing weekend overlooking the bay. We were happy to learn when we arrived that there are food places to eat at within the Holiday Inn! This area in particular is a great area to stay if you are a photographer. The sun sets over the bay with the city skyline (small as it may be) just to the south of the sunset. The color reflects nicely off of the calm waters of Grand Traverse Bay creating a reflective reddish and magenta tint throughout the area. I was able to take several photos of the sunset in Traverse City and also have a timelapse video that I will post once I get that video done. I enjoyed my stay in Traverse City so much that I am eager to get back to the city, perhaps even before winter! It was my first time visiting northern Michigan and the land and communities surrounding Traverse Bay are absolutely stunning. The location is great (although I would worry about the winters) and it’s proximity to Sleeping Bear National Lakeshore and Mackinac Island make it a nice destination for travelers. My dream someday would be to have a small cabin in the area just west of town and near the coast, but in the meantime, I’ll likely continue staying at the Holiday Inn West Bay when I come into town to visit and I recommend this hotel to anyone who is traveling to Traverse City and looking for a good beach area resort that is close to Traverse City’s downtown area. Sunset at Holiday Inn – West Bay in Traverse City by Joey B. Lax-Salinas is licensed under a Creative Commons Attribution-NonCommercial-NoDerivs 3.0 Unported License. Permissions beyond the scope of this license may be available at http://www.joeyblsphotography.com. 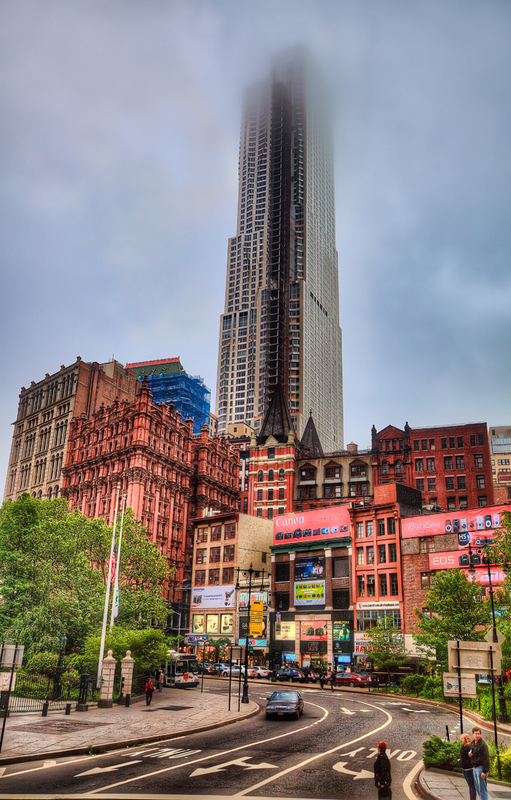 The Park Row buildings in lower Manhattan, New York City. Park Row New York Buildings by Joey B. Lax-Salinas is licensed under a Creative Commons Attribution-NonCommercial-NoDerivs 3.0 Unported License. Permissions beyond the scope of this license may be available at http://www.joeyblsphotography.com. The Milwaukee, Wisconsin skyline after a spring storm. This photo was taken on top of a bridge that overlooks Fond Du Lac Avenue looking east towards downtown Milwaukee. I’ve only been to Milwaukee a couple of times, but when I do go, I like to stop by the Wisconsin Cheese Mart downtown to sample cheeses and beers. Summerfest is also a great live music venue to go to in the summer. In June 2010, I saw free back-to-back shows of musician Ryan Cabrera followed by comedian and food smasher Gallagher while visiting the city. Check out other skyline photos that I’ve taken over the years! Milwaukee Skyline after a Spring Storm by Joey B. Lax-Salinas is licensed under a Creative Commons Attribution-NonCommercial-NoDerivs 3.0 Unported License. Permissions beyond the scope of this license may be available at http://www.joeyblsphotography.com. The historic front porch of the Grand Hotel on Mackinac Island is known to be the longest front porch of any hotel in the world. The Grand Hotel, which in 2012 celebrates its 125th anniversary, has been a well known hotel for well over a century and came to Hollywood fame in 1980 with the romantic movie Somewhere in Time starring Christopher Reeve and Jane Seymour. The Grand Hotel has one hundred rocking chairs that overlook the gardens and fountains in front of the hotel. From the front porch you can also see out into Lake Huron and out to the Mackinaw Bridge just southwest of the hotel. The Front Porch at the Grand Hotel, Mackinac Island by Joey B. Lax-Salinas is licensed under a Creative Commons Attribution-NonCommercial-NoDerivs 3.0 Unported License. Permissions beyond the scope of this license may be available at http://www.joeyblsphotography.com. 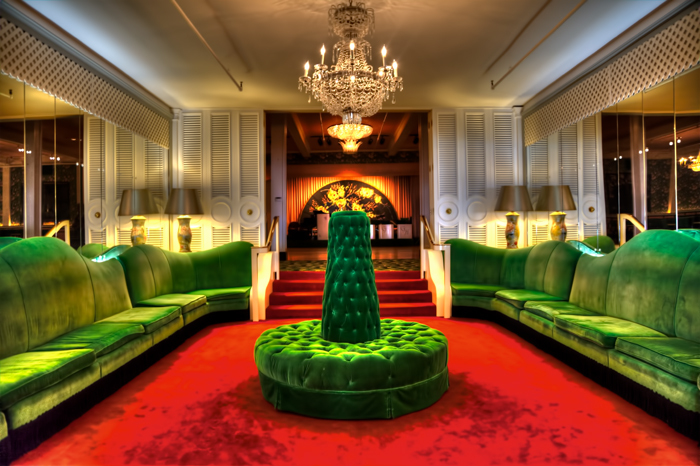 The green velvet couches at the historic Grand Hotel on Mackinac Island are the perfect touch to a building that dates back 125 years this year. This room is located on the main level just behind the main lobby and near the staircase in the center of the building. Green seems to be a color that is seen frequently, including in the dining room of the Grand Hotel where the upholstery for the chairs is a wide-striped green and white pattern. The lobby of the Grand Hotel is also vibrantly adorned with rose patterned carpeting, old furniture, photos and memorabilia located throughout the hotel. The Green Velvet Couches at the Grand Hotel on Mackinac Island by Joey B. Lax-Salinas is licensed under a Creative Commons Attribution-NonCommercial-NoDerivs 3.0 Unported License. Permissions beyond the scope of this license may be available at http://www.joeyblsphotography.com. Once upon a time, long long ago, I was a college student with dreams of making it to Hollywood. I went to Indiana University in Bloomington and earned a B.A. in Telecommunications with a concentration in video production. My grand idea was to make videos and films and write screenplays. Today, I still make videos, but on a much different level than my early beginnings. The video above is the last video that I produced while I was in college and it was produced in the fall of 2002. The video was shot in my apartment at college and the gray rabbit was my rabbit and lived with me for all three years while I was at IU. This short video is called “The Legend of Brennon Mox” and depicts a college student who has just moved into an apartment only to find out that the grounds that the apartment is on is haunted by a former tenant who was killed years earlier. The video is only about 7 minutes long, and please forgive the 10 seconds of dead air as the movie begins. If you click the ad in the video, I make a tiny bit of money. So, ya know…that’d be really cool. 🙂 But don’t forget to watch the video if you click. The lobby at the Grand Hotel on Mackinac Island is adorned with old fashion furnishings, chandeliers, cabinetry and other historical items. As you walk around the lobby, there are many displays, old photographs, memorabilia as well as galleries and museums dedicated to the hotel as well as to the popular love story movie Somewhere in Time, which starred Christopher Reeve and Jane Seymour and was filmed at the hotel in 1980. Here, the lobby opens up to the front porch of the Grand Hotel (which is not seen and just off to the right of this photograph). Tea time is a popular time here in the lobby where guests gather to do just that – have tea! At the far end of the hall is the entrance to the dining room of the Grand Hotel, which is beautifully decorated and furnished. Lobby at the Grand Hotel on Mackinac Island by Joey B. Lax-Salinas is licensed under a Creative Commons Attribution-NonCommercial-NoDerivs 3.0 Unported License. Permissions beyond the scope of this license may be available at http://www.joeyblsphotography.com. 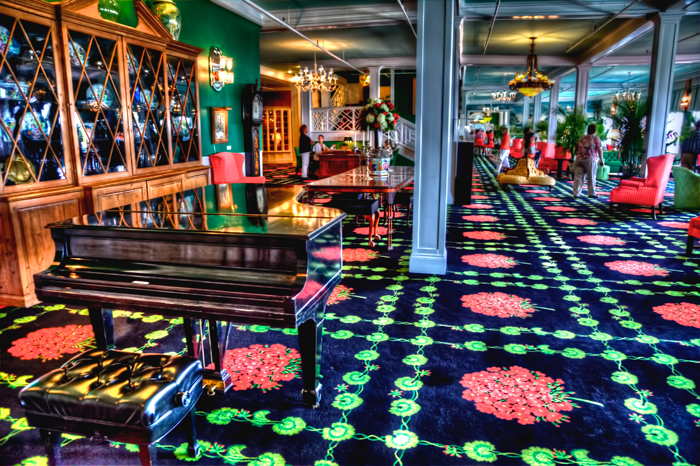 The dining room at the historic Grand Hotel on Mackinac Island is beautiful. The wood floors, old furniture and surrounding architecture of the room can take you back to a time over one hundred years ago. This photo was taken in June 2012 while I was visiting Mackinac Island in northern Michigan. During 2012, the Grand Hotel will be celebrating it’s 125th anniversary. The Grand Hotel has been famous for over a century, but was made infamous in the 1980 love story movie Somewhere in Time, starring Christopher Reeve and Jane Seymour. Dining Room at the Grand Hotel on Mackinac Island by Joey B. Lax-Salinas is licensed under a Creative Commons Attribution-NonCommercial-NoDerivs 3.0 Unported License. Permissions beyond the scope of this license may be available at http://www.joeyblsphotography.com. The Grand Hotel on Mackinac Island in northern Michigan is a historic hotel built in the late 19th century and made famous in the 1980 movie Somewhere in Time, a love story starring Christoper Reeve and Jane Seymour. This photo was taken in June 2012 during the 125th anniversary celebration of the Grand Hotel on Mackinac Island. This hotel is also known for having the longest front porch of any hotel in the world. The front porch of the Grand Hotel runs nearly the entire length of the hotel. The interior of the Grand Hotel features much of the original architecture of the building. There are several museums and galleries located within the hotel and non-guests are charged a $10 fee to enter the hotel to look around. Of the museums and galleries in the hotel, there is a small exhibit featuring photos and props from the movie Somewhere in Time including a hat worn by Christopher Reeve as well as the original Grand Hotel model that plays the music that is the theme for the Somewhere in Time movie. I was also able to capture several beautiful HDR photos of the dining room at the Grand Hotel as well as photos of the lobby at the Grand Hotel in vibrant detail. Be sure to see my full gallery of Grand Hotel photos, including photos taken from the front porch, of the green velvet couches and several others! HDR of the Grand Hotel on Mackinac Island by Joey B. Lax-Salinas is licensed under a Creative Commons Attribution-NonCommercial-NoDerivs 3.0 Unported License. Permissions beyond the scope of this license may be available at http://www.joeyblsphotography.com. The sunset at Presque Isle Park in Marquette, Michigan. This photo was taken in June 2012 along the shores of Lake Superior in the Upper Peninsula. Presque Isle Park is known to be a great location to view sunsets as well as the northern lights (also known as the aurora borealis). Sunset at Presque Isle Park in MArquette, Michigan by Joey B. Lax-Salinas is licensed under a Creative Commons Attribution-NonCommercial-NoDerivs 3.0 Unported License. Permissions beyond the scope of this license may be available at http://www.joeyblsphotography.com. The sun sets over the bay near Traverse City in northern Michigan. This photo was taken in June 2012 from the pier just east of the Holiday Inn – West Bay looking towards the west. Sunset in Traverse City by Joey B. Lax-Salinas is licensed under a Creative Commons Attribution-NonCommercial-NoDerivs 3.0 Unported License. Permissions beyond the scope of this license may be available at http://www.joeyblsphotography.com. 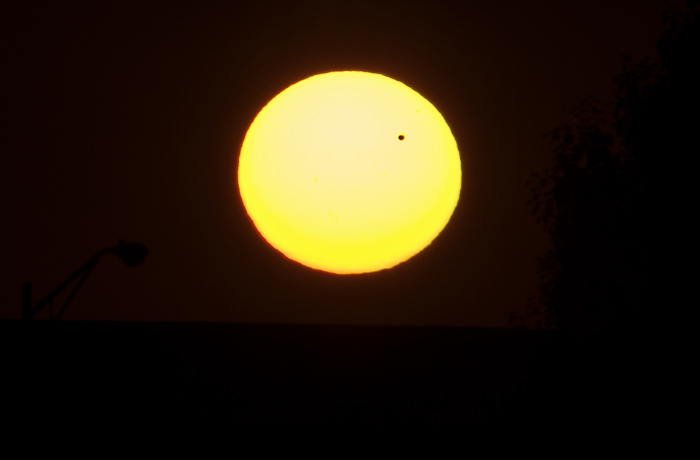 This is a photo of the Venus transit over the Sun on June 5, 2012, taken from Schererville, Indiana. This photo was taken just before sunset, around 8:15pm. The photo above is the same photo as the one below, except in the below photo I left the tree and the street light to provide some perspective to the size of Venus as it passes over the sun. 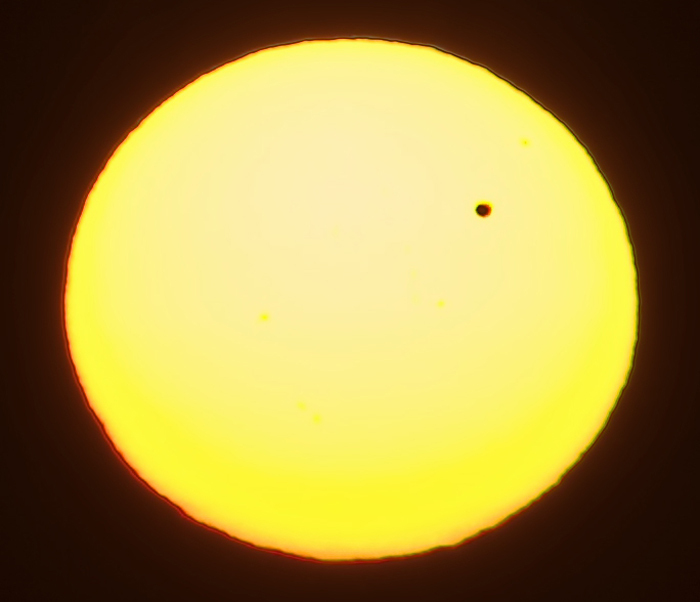 If you look closely, you can see what looks like small solar flares near the center of the sun and one just above Venus. This photo was taken using a tripod-mounted Canon 5D Mark ii DSLR camera using a 100-400 telephoto lens, fully extended using a wired shutter release at a shutter speed of 1/8000 of a second and F-stop at 40. Check out my solar eclipse photo taken last month! NEWS AGENCIES: I give permission for any news or weather agency to use this photo in any broadcast during the month of June 2012. Please credit the photo to Joey B. Lax-Salinas / JoeyBLS Photography. If published online, please site JoeyBLSPhotography.com as the source. Don’t forget to check out my photography page, including several other storm and weather photos and other photos taken from around the county! 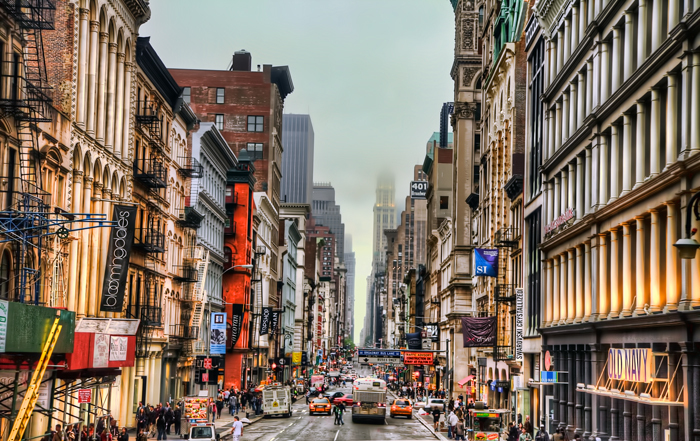 The shopping district in New York City’s SoHo neighborhood along Broadway Ave. Featured in this photo are Bloomingdales and Old Navy. View more photos from my New York City collection! Soho Shopping in NYC by Joey B. Lax-Salinas is licensed under a Creative Commons Attribution-NonCommercial-NoDerivs 3.0 Unported License. Permissions beyond the scope of this license may be available at http://www.joeyblsphotography.com. The Bow Bridge in Central Park is one of the more popular locations for both tourists and residents. Whether you enjoy the bridge for it’s beautiful elegance, history, movie fame, or simply to cross over, the Bow Bridge is also one of the most photographed bridges in New York City. Bow Bridge, Central Park in New York City by Joey B. Lax-Salinas is licensed under a Creative Commons Attribution-NonCommercial-NoDerivs 3.0 Unported License. Permissions beyond the scope of this license may be available at http://www.joeyblsphotography.com. Sometimes you come across an “aww” moment. While walking through Newport, Rhode Island myself holding hands with my girlfriend, we came across this couple walking slowly in front of us while holding hands. With the old shops, the angles and the details created by everything else; I had my camera out already, so naturally I had to snap a photo and this is what I got. I wish I knew who the couple was, but they were complete strangers walking through Newport, Rhode Island on Tuesday, May 24, 2011. I have plenty of photos of Rhode Island, particularly in the Newport area, including the 40 steps, Newport Harbor and more! Newport Couple by Joey B. Lax-Salinas is licensed under a Creative Commons Attribution-NonCommercial-NoDerivs 3.0 Unported License. Permissions beyond the scope of this license may be available at http://www.joeyblsphotography.com. 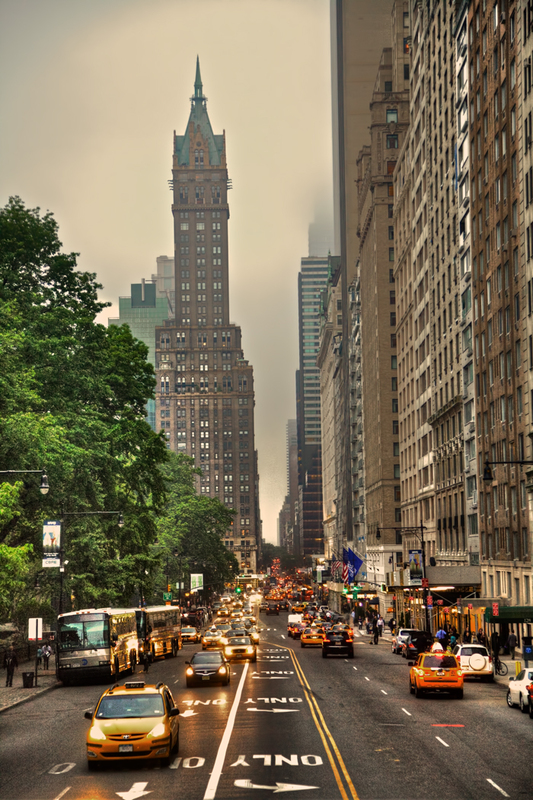 The view looking east on Central Park South in New York City. Central Park South New York City by Joey B. Lax-Salinas is licensed under a Creative Commons Attribution-NonCommercial-NoDerivs 3.0 Unported License. Permissions beyond the scope of this license may be available at http://www.joeyblsphotography.com.